The Gray Apartment involves a series of micro projects to upgrade and remodel a two bedroom, two bathroom loft space in Brooklyn. This compact guest bathroom required a gut renovation, including structural repairs to the existing flooring. The layout was reconfigured by moving the entry door, toilet and vanity sink. The original drop ceiling was raised and a light cove added over the new vanity area to provide a better proportioned space. Within the limited footprint of the existing bathroom, it was important to make the most efficient use of space. 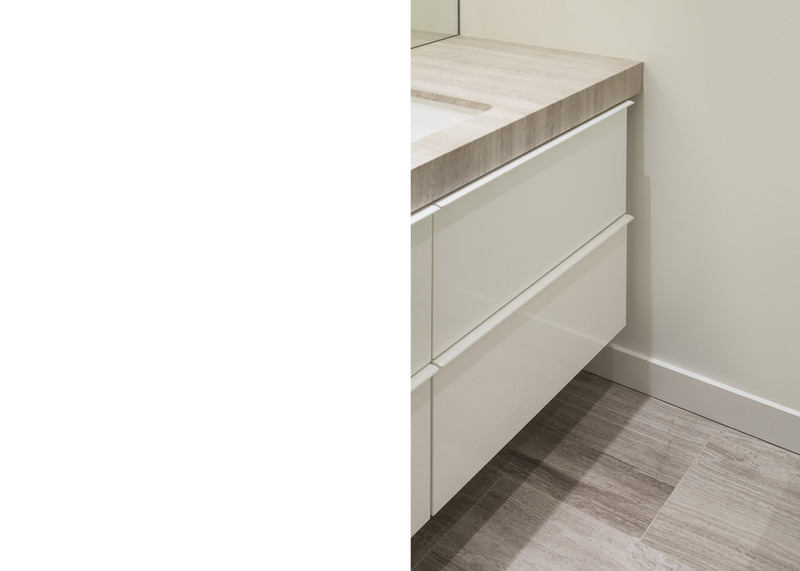 A new wall hung toilet frees up floor area, while the vanity drawer unit and flush medicine cabinet add functional storage. Driftwood marble is used for the vanity countertop and flooring, with white ceramic tile in the shower, gloss white cabinetry and painted plaster wall and ceiling surfaces elsewhere.